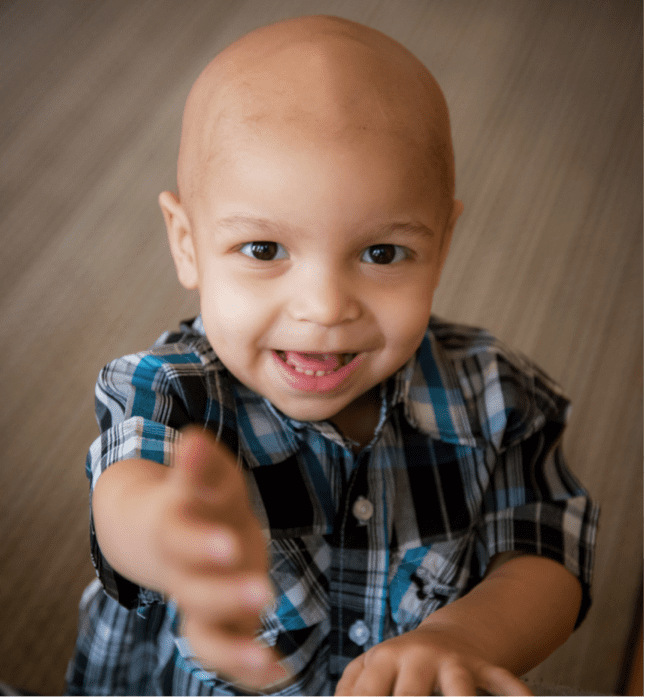 In honor of Sarcoma Awareness Month, we are featuring the story of Brendon, a brave sarcoma fighter. Sarcomas are rare cancerous tumors that develop in the body’s connective tissues. There are two main categories of sarcoma: bone and soft tissue. The disease affects both children and adults, but is much more common among children. Sixteen percent of the patients Family Reach served in 2016 had some form of sarcoma. Brendon is a very active two year old. He loves to run around with his older sister, Kimberly, and spend quality time with his baby brother, Matthew. Brendon was diagnosed with rhabdomyosarcoma last January and is in the midst of a two-year treatment plan that requires frequent inpatient stays and clinic visits. He spends approximately four days a week at Tufts Floating Hospital for Children, more than an hour away from his home. This schedule has had a major impact on his family’s financial wellbeing. MassHealth covers all of Brendon’s treatment and medical costs. It’s the non-medical expenses and loss of income that have really taken a toll on his loving family. His parents, Yeronely and Raphael, have had to take off a significant amount of work. One must stay with Brendon in the hospital for weeks at a time while the other looks after Kimberly and Matthew. Brendon doesn't let his cancer diagnosis get in the way of his positive attitude. This loss of income has made keeping up with rent and other monthly bills nearly impossible. The family was drowning and needed help staying afloat while fighting their son’s disease. Brendon’s social worker approached Family Reach. Our team immediately covered several months of rent. This has helped the family get back on their feet and keep a roof over their head as they power through the final phases of treatment. Brendon is a strong little boy. He had a successful tumor removal surgery in mid-May and is in the process of completing both radiation and chemotherapy! For as little as $15 a month, you can assist families struggling with a sarcoma and other cancers. Click here to learn how.